The Spanish version has been prepared in cooperation with Investigaciones y Estudios Superiores at Anahuac University in northern Mexico. The volume was presented in a limited special edition on January 19th, 2007 in Mexico and was very well received. 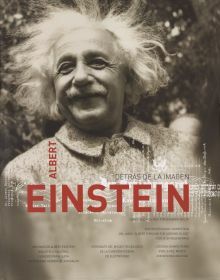 The volume preserves the style and design of the series' German version Albert Einstein. Privat und ganz persönlich. As all other local versions, it sports extra chapters, in this instance relating to Einstein's contacts with the Spanish speaking world. This will also cover his travels to Spain and South-America as well as correspondence with Spanish scientists. Since this version, Detrás de la imagen, was not produced for commercial sale and is therefore not availabe through bookshops, we intend to prepare a second edition, of course updated and enlarged, to be sold through commercial channels. No time frame has been fixed as yet, though. If you are interested in acquiring a copy of the first version, please send an email to Mrs. Tamara Kolangui at Anahuac University with the subject line "Albert Einstein book" and she will provide you with one.